According to the company, the Houston Food Bank has the highest rating of 100% (4 out of 4 stars) and was named top charity in Texas by CharityNavigator.org. It is America’s largest food bank in distribution and works with a network of 600 hunger relief charities, feeding 800,000 people each year. In 2016-2017 Houston Food Bank distributed 83 million meals. 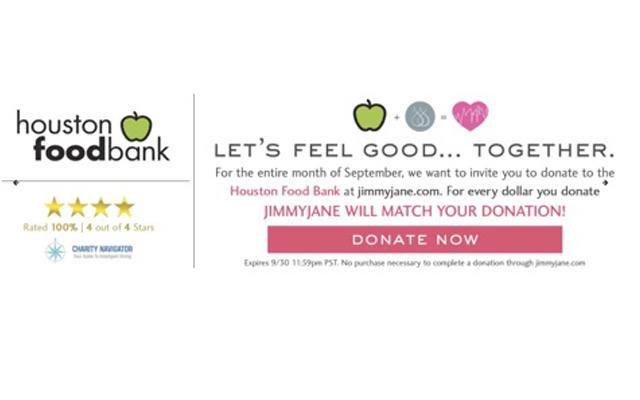 Anyone looking to donate can go to Jimmyjane.com/support-houston to make a donation up until Sept 30th (no purchase is necessary). Every dollar donated to the Houston Food Bank is equivalent to three meals per individual.